Have you ever been influenced to buy a beauty product? 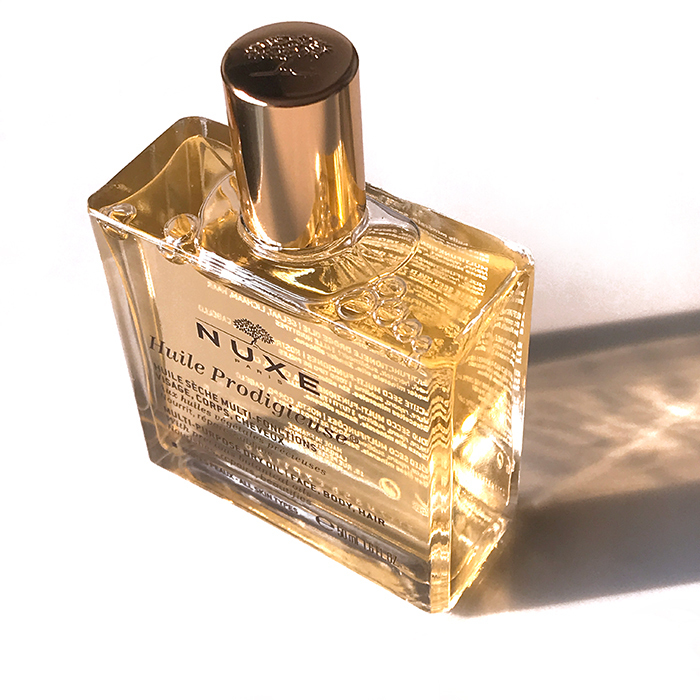 After spotting several alluring images of the Nuxe Huile Prodigieuse on Instagram, I was definitely intrigued by the idea of owning a multi-purpose dry oil. Since winter is around the corner, I decided to get my hands on a bottle to see whether it would really make a difference to my dry skin and hair. Here is my review. The oil comes in a square-shaped, glass bottle. This type of transparent packaging really shows off the colour of the oil and exudes a luxurious vibe. The spray nozzle is a big plus as it evenly disperses the oil and prevents any type of dripping and wastage. The ingredients are mentioned on an attachment behind the bottle. Once I spritzed the oil onto my arms and legs, I found that it glided on smoothly. Unlike most oils however, it absorbed into my skin quickly and dried down to a non-greasy finish. I also used a tiny bit on the ends of my hair and found that it soaked in almost immediately. The oil has a strong, floral scent which I quite like. However, it can be overpowering for those who are sensitive to smell. I’ve been using this oil for a few weeks now and I’m thrilled with the results its provided. On most days, I apply only the oil straight onto damp skin. When my legs feel particularly dry and itchy, I add a few drops of it to my body lotion. No matter how I use it though, it leaves my skin feeling unbelievably soft and smooth. It also imparts my body with a healthy, lit-from-within glow that looks great when I wear a dress or a skirt. When I use it on my hair, I find that my locks are more touchable and look glossier. It even manages to tame my frizz and baby hairs! Unfortunately, I can’t comment on how well it will work on your face, as I haven’t tested it yet in fear of the oils clogging up my pores. Nourishing, lightweight and non-sticky, this luxurious oil is definitely all it claims to be. Looks like all my Instagram stalking finally paid off!